For over 30 years, Sampson McPhee has provided innovative and practical solutions, timely and efficient service and a breadth and depth of knowledge and experience in all areas of the law to a diverse client base. They provide services of the highest calibre in every area of law, a goal to which the members of their firm are committed to at every level. The success of their firm has only one measure: the success of the clients they serve. At Sampson McPhee, they have long been guided by a tradition of doing the best that they can for their clients by doing good work. This tradition continues to serve as their foundation and their inspiration. Today, doing good work for their clients means advancing their position as knowledgeable, multi-disciplinary service providers with global competence. 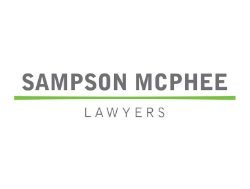 Sampson McPhee’s lawyers continue to demonstrate their qualities as innovative strategists, well able to handle the complexities of emerging industries, advancing technology and variable international economics to maximum advantage. Above all, their lawyers, students and staff share a common goal, excellence in all that they do. Sampson McPhee vigorously fosters an environment that encourages the individual and supports the firm. The unique qualities that each individual brings to the collective effort are fundamental to the continued success of their firm and its clients and they proudly acknowledge their contributions to their past and to their future.